International Women's Day has been celebrated for over a century – back then, women were still fighting for their right to vote. As this year's celebration rolls around on March 8th, it is important to remember that much still needs to be achieved. But also that women are making great strides toward equality, on their own terms. Point in case: the business world. Take a look around any boardroom table, and you will see very few female faces. That is changing, and faster than many men – and women – realise. 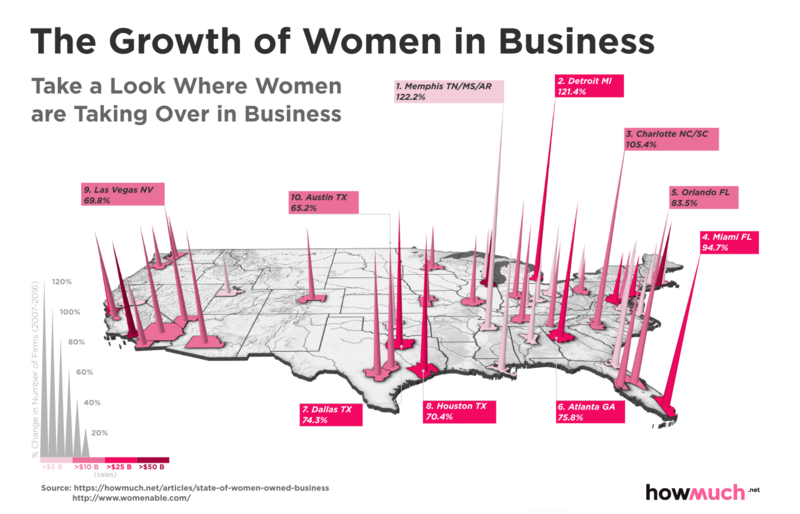 As this map shows, women are conquering the business world at a rapid pace. Memphis is America's number one boomtown for female entrepreneurs. Between 2007 and 2016, the number of women-owned businesses (WOBs) in Memphis rose from 31,454 to just under 70,000. That is a 122.2% increase, more than in any other metro area in the country. And Memphis is not the only city in which the number of WOBs more than doubled. Percentage-wise, Detroit just missed the top spot. But Motown's gain is far bigger in absolute terms: between 2007 and 2016, Detroit added twice as many WOBs as the Memphis total for last year. Charlotte came in third, adding more than 45,000 WOBs. These and other figures in the sixth annual State of the WOBs report by American Express point to a nationwide trend of booming female entrepreneurship. The nationwide average, by the way, is 45.2%. The relative positions of these cities in the Top Ten do not necessarily reflect the absolute increase of WOBs in each city. By that token, Miami leads the pack. Here is a ranking of cities by absolute number of WOBs added (that figure in brackets). The number of WOBs nationwide increased from 7,793,139 in 2007 to 11,313,900 in 2016. While the spikes on the map show the cities with the highest increases in WOBs across the nation, the colors reflect the turnover generated by WOBs in those cities – the darker, the higher the figure. The cities where WOBs generated the highest sales figures are not on the map, again because the increase in woman-operated businesses was relatively lower than in the Top Ten cities on the map. In the Greater New York metro area, female-led companies generated a turnover of just under $140 billion, way ahead of the second city on the list, Los Angeles, where WOBs turned over almost $95 billion. Chicago came third with a WOB turnover of just over $50 billion in 2016. So, while Memphis may be the nation's number one city in terms of WOB increase, the ladies of that great city have some way to go before they are an economic force to be reckoned with on a par with their sisters in NYC, LA and Chicago.